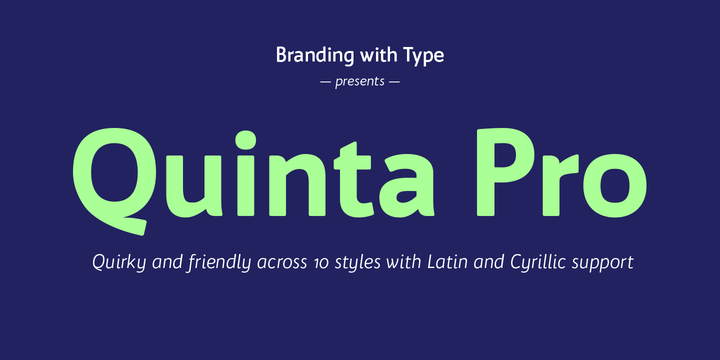 Bw Quinta Pro is a contemporary typeface created by Alberto Romanos and published by Branding with Type. With a humanist touch, it is characterized by subtle rounded corners, 5 weights & italics, optical x-height correction, over 500 glyph per style and some OpenType Features. Also it has multilingual support. You cannot miss it! Price: all 10 fonts for only $199,00. A font description published on Friday, November 13th, 2015 in Alberto Romanos, Branding with Type, Fonts by Alexandra that has 5,008 views.